The Sharpe Ratio, invented by William Forsyth Sharpe is also known as the Sharpe Performance Index. It is a measure of reward (or excess return) per unit of risk. The formula uses standard deviation as the unit of risk. Reward (or excess returns) is measured as the difference between the portfolio's return and the risk-free rate of return over a period. The higher the Sharpe Ratio, the better the portfolio's performance. It is important to know that a portfolio can achieve higher returns by taking on additional risks. The Sharpe's Ratio allows us to determine whether the higher returns come from better performance or from additional risks. The Sharpe Ratio is quite similar to the Treynor Performance Index in the sense that it measures excess return per unit of risk. The difference is in the definition of risk. Treynor Performance Index uses Beta while Sharpe Ratio uses Standard Deviation. The Treynor Performance Index is suitable for investors who have diversified across funds while the Sharpe Ratio is suitable for investors who put their money in only one or two funds. 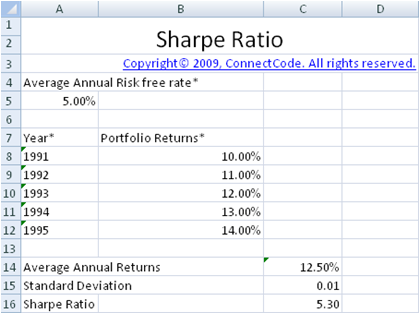 The SharpeMultiplePortfolios worksheet calculates the Sharpe Ratio for up to 5 portfolios.